Quick! Look out the window! Do you see that? Do you? It’s ‘sunshine’. I know!! Take a photo of it, quick, the clouds will be back any second. In celebration of the sun making a very overdue appearance I have a new and deliciously sunshiny book to hug to my chest today. 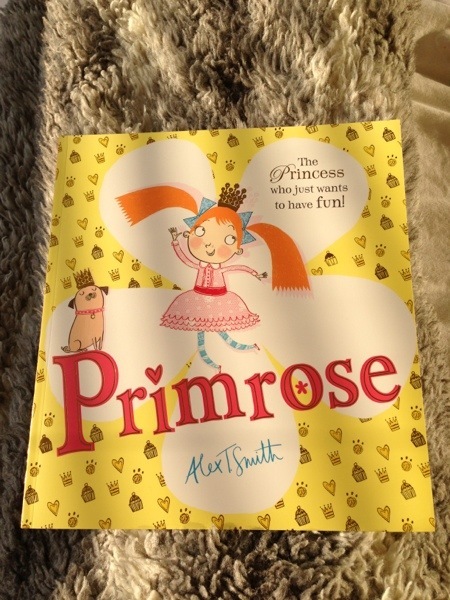 I give you Primrose by Alex T. Smith. Fans of Ella are in for a treat with this one as we meet Princess Primrose and her Royal family at the palace. Princess Primrose has everything she could possibly want, including two prancing pink ponies. But life at the palace is sooooo boring! Everyone is terribly serious and properly proper. All Primrose wants is some fun. Together with her loveable pug dog she tries climbing trees and dressing up and bouncing on the bed, but each time she has a smidgen of fun she is caught by one of the grown ups and made to be a properly proper princess. How very dull! She is not allowed to play games or dig for vegetables or bake cakes. No matter how much she tries. Her family despair. When she is found having a dip in the fountain everybody agrees that something must be done. Time to bring in… Grandmama! Grandmama’s arrival doesn’t go quite as the family had imagined and soon they are all remembering the importance of giggles and fun. This is a delicious book. It is perfect for reminding children – and their adults -that the simple things in life are often the most important. It celebrates play and the imagination and having oodles of fun. This book basically shouts ‘look, the sun is shining, work is dull, go out and play and eat cake’ What’s not to love about that? The style is similar to that of Ella with lots of brilliant and very funny detail and it would be the perfect compliment to Caryl Hart and Sarah Warburton’s Princess and the Peas. Percy the Pug dog is comedy genius! Look out for his super-snazzy suit, it’s perfection! A real winner for me for it’s sunshiny fun and frolics, it’s comedy, the celebration of play and innocence and it’s slap in the face for perfect pretty pink princessness. Priceless. 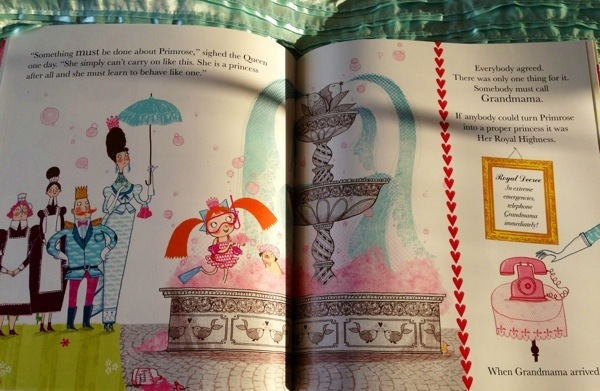 Primrose is published in April 2013 by Scholastic. Oh, Dog, How I Do love you!